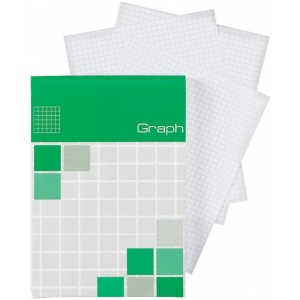 Perfect for home work or on the go these multi-purpose note pads are designed for convenience. * The white high-grade vellum sheets are approximately 20 lb. basis weight and perforated for easy removal. * Rigid heavy-duty chipboard backing provides considerable support when writing on the go. * Creased covers are designed to neatly fold out of the way while in use. The grid size/pattern is 5" x 5". The quantity is 80 sheets. The weight is 20 lb. Grid Size/Pattern: 5" x 5"